Although we are only half way through November, you could be forgiven for thinking that winter has begun a little early this year. Dark nights have well and truly taken hold, rain and high winds are battering the UK and temperatures, particularly in the evening, have plummeted. This has led to a rise in slipped tiles, roof leaks and in the number of cases of condensation whilst simul­ta­ne­ously causing people to think about how they can keep their home warmer for longer at a cost-effective price. Energy bills typically peak at this time of year so it is important to reduce the cost. Damage to the environment must also be considered. It is a well-known fact that heat rises and consequently most of the heat lost from any building occurs at roof level: the need for proper insulation is clear. Making sure that the minimum of heat can escape is essential to maintaining a comfortable indoor temperature at a reasonable financial and environmental cost. 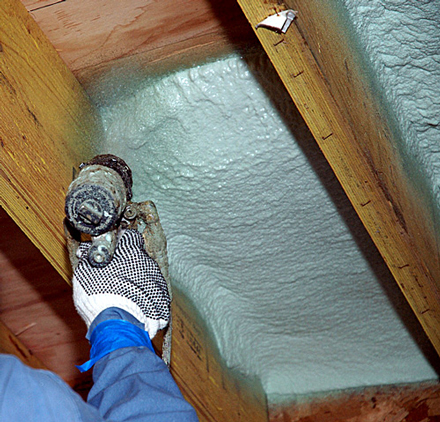 One of the most efficient ways of achieving these desirable effects is the application of spray foam insulation. The process works when the foam is applied to the underside of roof tiles where the closed-cell polyurethane foam expands to fill all gaps and give superior air-leakage control, insulating the roof and offering protection against tile slippage. Instantly upgrading thermal performance, the foam has the added benefit of reducing condensation in the property. Multi-purpose spray foam insulation is also ideal for use in industrial units, caravans and house-boats, whilst being quick and simple to apply by tradespeople and DIY enthusiasts alike. It can be used effectively on a number of different surfaces, including wood, brick, metal, concrete, slate and fibreglass. As with all products of this nature, operating instructions should be adhered to and the appropriate protective clothing should be worn. 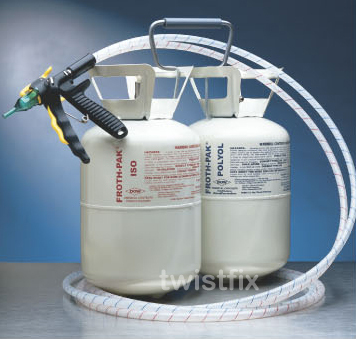 Spray foam insulation is just one of the extensive range of Twistfix damp proofing and related products, which includes wall ties for masonry crack repair,­ water­pro­ofing membrane,­ rubber roofing,­ resin injection and mould removal products. For information, advice and support on any of our products and services, please browse the website or contact a member of our skilled team. For more information on spray foam insulation and other products please browse our website or contact a member of our team directly. Call 0845 123 6006 or email sales@twistfix.co.uk.